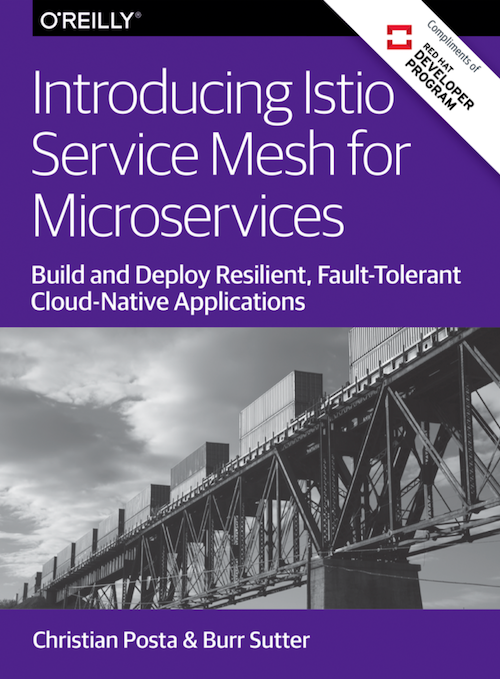 Take a look at this new reference book for Istio, by Burr Sutter and Christian Posta, to help you get started with the Istio service mesh for microservices. Burr Sutter (@burrsutter) and I (@christianposta) have finished writing a small book to help folks get up and running with Istio.io service mesh! Many many thanks to all of the reviewers who took the time to give feedback and for Red Hat for sponsoring my time especially Burr Sutter and the talented folks at O'Reilly who helped coordinate the effort and make it come to fruition. Download the complimentary ebook at developers.redhat.com. Understanding Istio and the importance of its capabilities in a microservices architecture. This book should be a nice quick intro to Istio. Please take a look at Istio.io for more. The book is based on a hands-on workshop the wonderful Red Hat Developers team put together. Find the latest version of the workshop as well as the branch from the book. We will have printed books to give away at Red Hat Summit 2018 in San Francisco. The dates of the conference are May 8th - 10th at the Moscone Center. We'll also be doing a handful of microservices events across North America which should be another opportunity to get printed copies. Or, reach out to me @christianposta and we'll find a way to ship you a printed copy. Follow along on my blog, the Red Hat Developers blog, the Istio.io blog and Istio.io. Also, stay tuned for the "Istio in Action" book that I'll be writing for Manning.